If you are in a beauty rut, try something new with your hair this spring. Check out these hot spring hairstyles. This spring, look for hairstyles that are inspired by the ’60s. 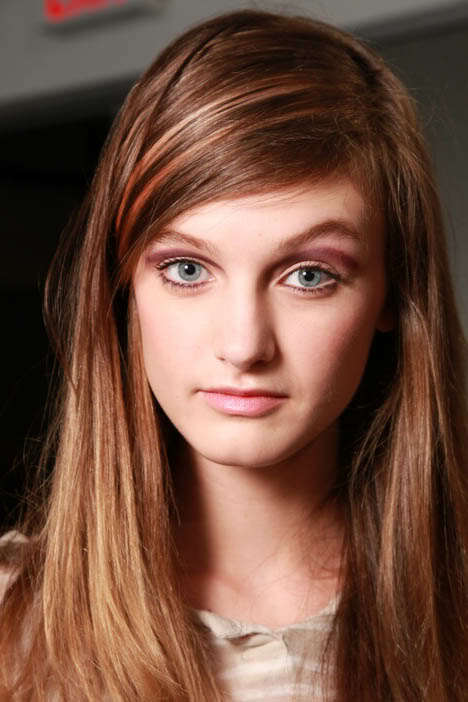 At the Peter Som Spring 2012 Fashion Week presentation, we saw ’60s-inspired hairstyles with dramatic side parts and forehead sweeping bangs. Peter Som says that spring 2012 is all about balancing strength and femininity, and that definitely comes through in this style. “It’s a little bit like Julie Christie-meets-Courtney Love. It’s quite a rock and roll texture, but the hairstyle is very much sourced from the ’60s,” explained Wella Professionals global creative director Eugene Souleiman. He described the look as “kind of bad hair for a bad girl coming from a rich family.” Souleiman offers these tips to recreate the look. After shampooing and conditioning your hair, prime wet hair for styling with Velvet Amplifier, which prepares hair to maximize the benefits of styling products. Blow out hair with a large round brush to create volume and movement, and then lightly mist dry hair with Thermal Image Heat Protection Spray. Create a deep side part with hair swooping over the side of the face and pin hair underneath to keep it in place. Using a large barrel curling iron, set several curls in place with remaining hair down the center of the head for added lift. Unravel the curls and tousle with your hand after a few sprays of Ocean Spritz to create a light, textured feel. Tired of the same old ponytail? Pull your hair back and into an intricate fishtail braid instead. This look works for casual days or a special evening out. 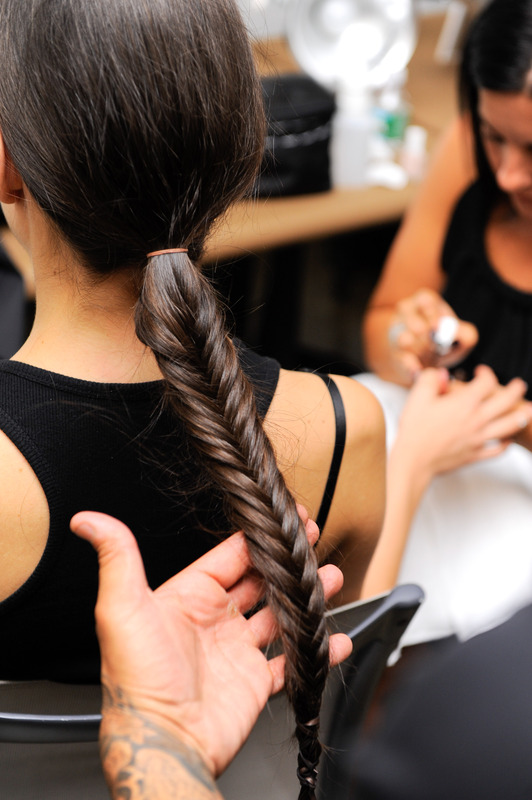 Sebastian professional stylist design team member Anthony Cole created fishtail braids backstage the Pamela Love Spring 2012 New York Fashion Week show. Find out how to get this look with his tips below. Create a low ponytail and secure with an elastic. Break the ponytail into two equal sections. Take a 1/4-inch piece of hair from the bottom of one section and pull it out and over, and add it to the other side. Repeat this with the other section and continue repeating this maneuver until the braid is complete. Use sections of hair larger than 1/4-inch towards the bottom of the ponytail so that the braid does not thin out. Secure the braid with an elastic. For a more textured look, run fingers up and down the braid and pull out random pieces. Spritz with hair spray to keep the style in place. Summer isn’t here quite yet, but long, loose, beachy waves are definitely in for spring. After shampooing, roughly blow dry your hair to add volume. Then, spray texturizing spray throughout your hair and wind it into a low bun, pinning it into place. Apply heat to the bun with your blow dryer using the diffuser attachment. When you hair is completely dry, give it a shot of cool air to set it. Once cool, remove the pins and release the bun. Run your fingers through your hair for loose, tousled waves. If you are thinking about going short, now is the time to do it. Short — super short — hair is on-trend for spring. Pixie cuts are all the rage. Low maintenance short haircuts work for straight or curly hair. Just remember if you have curly hair, don’t leave it too long on the top or you’ll end up looking like a Q-tip.